Recently, a customer faced issues to inject Internet Explorer 10 in his Windows 7 image which was built bij ConfigMgr 2012 SP1. We discovered that injecting IE10 using Offline Servicing prevented us from successfully injecting IE10. In order to be sure the hotfixes are injected before IE10 itself, I created 2 folders. One folder had all the hotfix .msu files lister above, called ‘ie10prereqs’. The other folder contained the extracted files from the ie10 installer, called ‘ie10’. The image file was copied to my local disk. I created a folder named ‘mount’ to use as a mounting directory. The modified image was added to ConfigMgr and I was able to successfully deploy Windows 7 with IE10. When setup is canceled, the %TEMP%ConfigMgrAutoSave.ini file is still there. This is pretty nice. Copying the file to a different location might be helpful to allow the run the installation again. I guess some people would say that my attempt is rather silly but I was just curious in finding out the possibilities. Recently I was investigating the possibility to use MDT to provide some sort of automation for deploying certain server workloads. My main focus is System Center so I decided to attempt to have an LTI of ConfigMgr 2012 SP1. I am aware of Powershell Deployment Toolkit (PDT) which is developed by Microsoft. However, Microsoft claims that PDT can only be used for lab and test purposes so I decided to try to use MDT instead. Investigating the LTI deployment gave me quite some challenges. I needed to investigate if each step could run using an unattended command. Installing the Roles & Features was pretty easy, I added a sources path because .NET Framework 3.5 is included (something .NET Framework 3.5 needs). My SQL skills are too limited to generate a command which will set the SQL memory requirements for ConfigMgr (feel free to inform me how to do this). I ignored the WSUS config for the LTI. The .ini for ConfigMgr is very static and contains a lot of hard-coded input. It would take a lot of time to investigate how to generate an .ini file during deployment which would dynamically populate the lines in the file. Result is a successful, but rather ‘crude’ ConfigMgr 2012 SP1 deployment. I have to admit that I wasn’t really satisfied accomplishing my goals, it was pretty time consuming as well. I might have an attempt to investigate if I can achieve something similar with the other System Center products but for now I consider it pretty time wasting. In many organizations where I introduce Configuration Manager 2012 SP1 (and/or R2 soon) customers ask me how to deploy applications as efficiently as possible. Configuration Manager 2012 provides administrators a ton of options on how to achieve this. Unfortunately, I’m not able to explain what would be THE solution but after thinking this over I believe I can provide a recommendation that comes close. The first goal organizations should achieve, is to virtualize as many applications as possible using App-V 5. Application Virtualization allows administrators to deploy applications to end users, the application can be started on the desired location but it doesn’t require an installation (.msi does). This is particularly convenient in SBC and VDI environments. SBC environments requires an installation which would disconnect user sessions (change user /install and change user /execute), with application virtualization this is no longer required. For a while I was struggling to figure out how to deploy these applications as efficiently as possible, but then it hit me: Shared Content Store Mode. It took a while for me to understand how it works because I couldn’t find out where the content is actually shared. You can enable Shared Content Store Mode but you’re unable to configure its location. I figured out that the distribution mechanism tells the App-V client where the content is available. The Configuration Manager client is responsible for retrieving the required information using a Distribution Point, this makes the DP the Shared Content Store location effectively. All you need is to configure the deployment to stream all the content from the DP, a very small set of files (just a few KB) will be downloaded to the client machine to allow the application to be started (shortcuts etc.). The Shared Content Store Mode is extremely useful for SBC and VDI environments, I can imagine you would consider using it on desktop machines as well. Laptop and tablet devices are less likely candidates to use Shared Content Store Mode since they will most likely leave the building which might prevent access to a DP using a fast LAN. For those environments I would actually recommend downloading the virtual application locally and run it from the local disk. SBC and VDI environments are often configured by a provisioning mechanism such as Citrix Provisioning Services (for SBC), for VDI the most likely configuration is pooled VMs. Finally, using application supersedence allows administrators to quickly replace virtual applications with newer versions (even revisions of the same virtual application), replacing a few KB of data is something that end users would barely notice. At the moment I’m currently researching the possibility to automate server deployments with applications using MDT 2012 U1. In order to have a good understanding of automating the required steps, a lot of trial and error is used to see if everything works correctly. As we all know MDT logs on with the local administrator account to finishing installing the steps configured in the Task Sequence. When the account logs on it automatically starts Server Manager to allow administrators to configure the server. While this may work well for manual deployments, for automated deployments I personally find it somewhat frustrating to have Server Manager started automatically. This is the default setting for Windows Server 2008 and newer.I believe Windows Server 2003 has some similar behavior but I don’t remember my last Windows Server 2003 deployment (the solution doesn’t apply to Windows Server 2003). It eats resources as well. After looking around a bit on the Internet I learned that you can configure this behavior by GPO. I would be able to create just two Task Sequences, one for Client machines and one for Servers. Even though ConfigMgr without MDT integration has quite some Task Sequence Variables available, I find them somewhat difficult to understand. I need to do quite a lot of WMI querying to figure out what I need. Fortunately, MDT creates a lot of properties during the ‘Gather’ step. During this step, the script ZTIGather.wsf is executed. The results of this script are logged in the file ZTIGather.log. The default location for this log is %WINDIR%\CCM\Logs. If ccmsetup.exe is instructed to use a different location, then the log is placed on the alternate location specified. 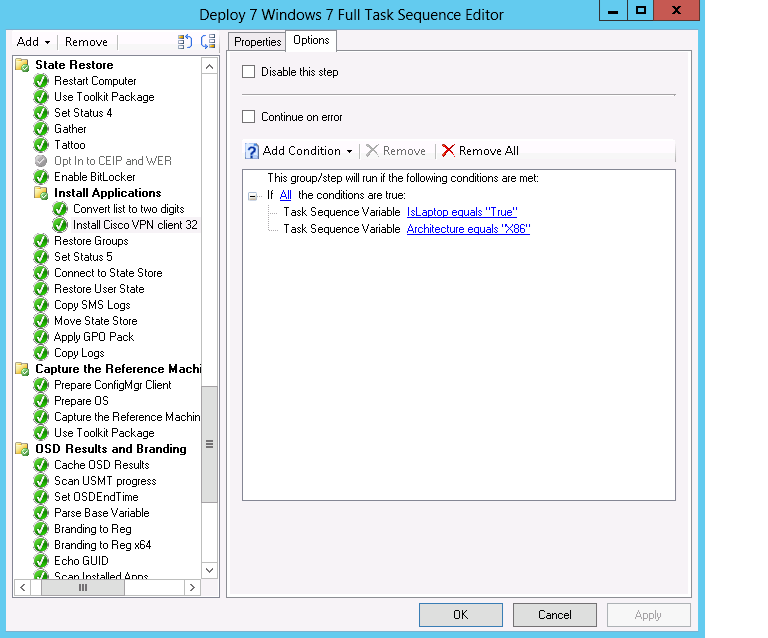 You need to deploy applications using ConfigMgr 2012. You need to provision applications to end users, these end users need to use the Application Catalog website to install applications on demand. However, User Account Control (UAC) is enabled with the default settings. Company policy requires UAC to be enabled. Users have no admin rights, company policy forbids this privilege. End users are not allowed to install their own software. Software published in the Application Catalog are allowed to be used. Default users receive a prompt every time they want to start installing an application from the Application Catalog. Users need to provide credentials of a user who has these administrative privileges. Since they don’t have one, all installations fail. This behavior is by design, this is how UAC works. I was faced with this challenge at one of my customers. ConfigMgr 2012 allows using the local SYSTEM account to install applications (Run with administrative rights). The local SYSTEM account has administrative privileges which will install applications successfully. The Application Catalog provides separation between publishing applications to users, and the account used to install them. I know the separation exists so I must find a way to allow the installation of applications provided by ConfigMgr 2012 to run successfully without UAC kicking in, but UAC should not be disabled.